Waves are Margolin’s world. 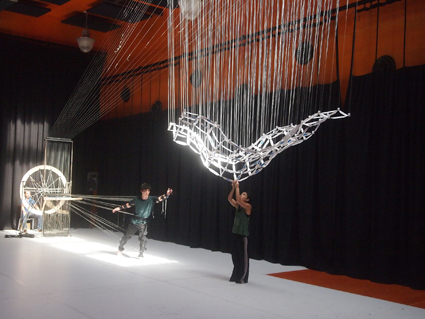 From his studio in Emeryville, California, the 40-year-old creates intricate kinetic sculptures that employ thousands of moving parts to embody the waves that occur across the natural realm. 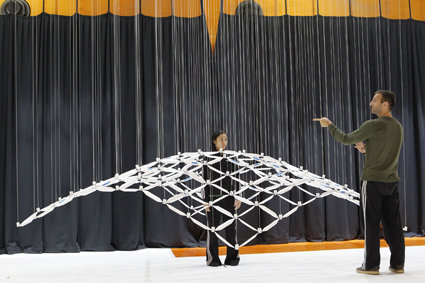 He visited Melbourne recently to deliver the sculpture he’s devised for Chunky Move’s Connected, a work which will see dancers harnessed into one of the artist’s complex moving wave-machines. 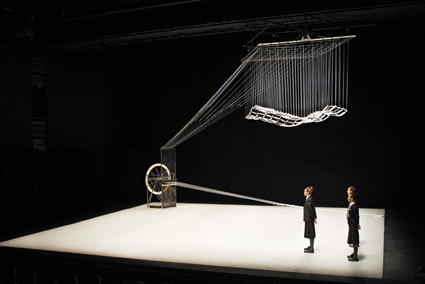 Connected is a departure from Chunky Move’s more recent high-tech projects due to the mechanical materiality of its sculptural centrepiece. Margolin’s wire-and-string creations don’t engage with the ethereal invisibility of electronics. Apart from the occasional motor, the forces that produce his waves are simple physics. Margolin’s exploration of waves has also resulted, perhaps organically, in a broader philosophical view of the patterns of life. “I think that having studied the wave I have a little bit more tolerance than most people that there’s going to be some good times and there’s going to be some bad times. There’s going to be times when I have no money and times when I have money. Times where I’m really happy with what I’m doing and times where I’m not.